Sign up for Twitter to follow York Tea Party (@YorkTeaParty). "Whenever the people are will informed they can be trusted with their own government; that whenever things get so far wrong as to attract their notice, they may be relied on to set them to rights." You’ve got talent, right? It’s time to show it off! Musicians, comedians, dancers, singers, impressionists, jugglers and magicians are all invited to audition for Williamsburg’s Got Talent tomorrow, Tuesday, Nov. 1. Sign up now! Click here to register. The top 10 acts will appear in Williamsburg’s Got Talent in front of a live audience on Saturday, Nov. 19 at Colonial Heritage. You’ve got talent, right? It’s time to show it off! Musicians, comedians, dancers, singers, impressionists, jugglers and magicians are all invited to audition for Williamsburg’s Got Talent either today, October 29, or Tuesday, November 1. Sign up now! Click here to register. The top 10 acts will appear in Williamsburg’s Got Talent in front of a live audience on Saturday, November 19 at Colonial Heritage, an event that will benefit the nonprofit Williamsburg Land Conservancy. The third in the series of York County Hunt for History events will be held Saturday, Nov. 5, from 10 a.m. to 2 p.m. at Seaford Elementary School, 1105 Seaford Road, in York County. ♦ Ms. Susan Antoniewicz do a presentation about the history of Dandy. Archivists from the York County Historical Museum will be available to digitally copy family letters, photos, diaries, hand-drawn maps and other family documents of historical significance. They will also photograph three-dimensional objects/items of historical significance. Items should be originals and owned by the individual presenting the materials. Individuals will be served on a first-come, first-served basis. Please pass this along to club & committee members & fellow conservatives!! We look forward to seeing everyone at these events in these last days before the Nov. 8 election!! 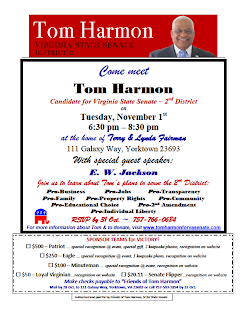 Join Tom & his team as they bring Tom’s message & information to this area of York County & meet the voters! We’ll still walk even if it’s raining – it REALLY sends the message to voters that we care that much about electing Tom Harmon! 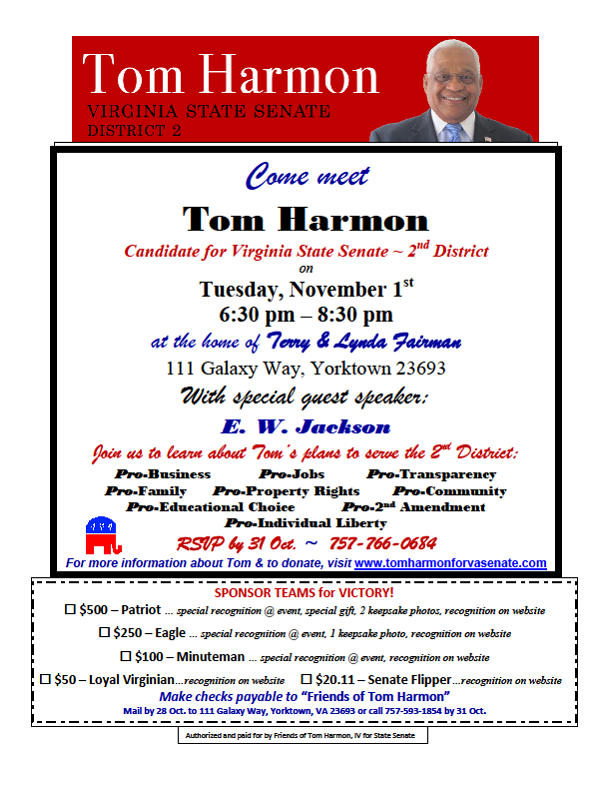 · Tuesday, 1 Nov., 6:30pm – 8:30pm Meet & Greet/Fundraiser @ Terry & Lynda Fairman’s home (invitation attached & below!) with special guest speaker & Constitutional patriot, E. W. Jackson! · 30 Oct. – 7 Nov., late afternoons & early evenings; PHONE BANKING from your own home! · Tuesday, 8 NOV – ELECTION DAY Poll Watchers!! · If you need Tom’s literature, yard signs, bumper stickers, etc., contact Lynda Fairman (757-593-1854), Carl Anderson (757-870-6081), or CM Darryl Postell (757-303-8871)!